You’ve probably heard it from everyone, including other posts/pages on this site. But, your grinder is probably more important than the machine. A quality grinder can even benefit the most budget of machines. But, a quality machine can’t make the best of a poor grind. Now, “budget” is a word that is thrown around a lot, and it means different things to different people. If you are on a budget, you have a fixed amount you can spend. But, a “budget” grinder is generally seen as “cheap”. If you want cheap, get a Capresso Infinity. It will work. If you want something that will last and will make excellent espresso and not break the bank, usually Baratza is thrown around (specifically the Preciso). But, if you can stretch, for about the same price as a Vario, the grinders from Macap (from Venice Italy) are prosumer grinders and produce awesome results. 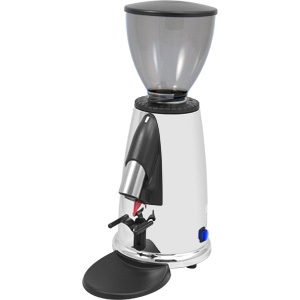 At $475, the Macap M2M is the low end of the Macap line of doserless grinders but, boasts some top end features. First, it’s doserless (also referred to as “on demand”). This is because you grind what you need right into the portafilter rather than have grinds sit in a dosing chamber. If you are a home user, or low volume shop, you will be letting a lot of coffee go stale in that doser. The Macap M2M has a small footprint (only 15in tall), but thanks to 50mm burrs, it grinds through a dose pretty quickly (I’m seeing 18gr in 14sec). And, it has a portafilter trigger which allows you to just push the portafilter under the grinds chute to start dispensing the coffee. It weighs 10lbs and it makes you feel like a barrista to use it. and it’s chrome body looks pretty darn nice on your counter. Where it differs from a “pro” grinder is that adjustments on the Macap M2M are stepped. This means that you don’t have infinite adjustments to perfectly dial in a grind. But, with the amount of steps it has, you can dial it in very very close to perfect. However, adjusting is a tiny bit annoying the first go because the “0 point” is not really easy to see. The adjustment collar has numbers on it, but if you go all the way to what is labeled as 0 the burs will be touching and you’ll break the grinder. Starting at the label of 3 on mine was a good place to begin and I was able to dial in a shot in 3 tries. All grinders, when grinding as fine as espresso requires have some clumping in the grinds. But, not all clumping is equal. The Macap has some clumps, but they fall apart quickly when you shake the portafilter. Mostly the grinds are fluffy and very even. The Macap M2M is a great grinder for someone with a prosumer machine, or someone that aspires to move up to a prosumer machine. Even with a lower end machine, the Macap will change your cup quality for the better instantly. If you are considering a Baratza, and are really only grinding for Espresso, consider a Macap as well.